The Orange County Museum of Art (OCMA) in Santa Ana, California, is planning to open a new temporary gallery space in the South Coast Plaza Village on November 3 as work on a new 52,000-square-foot facility by Morphosis gets underway. The temporary facility—dubbed OCMAEXPAND-SANTA ANA—will be located in a former retail space in the Victor Gruen–designed shopping mall and will host five seasons’ worth of exhibitions between this fall and 2021 when the new museum opens. This year’s inaugural season will feature exhibitions by the artists Kathryn Garcia, Valentina Jager, Alan Nakagawa, Mariángeles Soto-Díaz, Rodrigo Valenzuela, and Ni Youyu and will be on view through March 17, 2019. Cassandra Coblentz, senior curator and director of public engagement for OCMA, explained further, “Our goal is to create a dynamic space for artistic innovation, experimentation, and dialog.” The museum plans to do this by focusing exhibition on artists and topics relevant to California and the Pacific Rim, a major initiative the institution has undertaken in recent years. 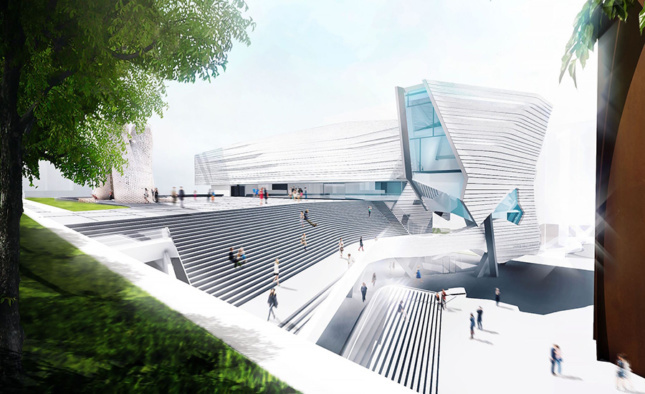 The Morphosis-designed complex will begin to rise nearby at the Segerstrom Center for the Arts—a cultural complex that includes an existing concert hall and reperatory—starting in 2019. 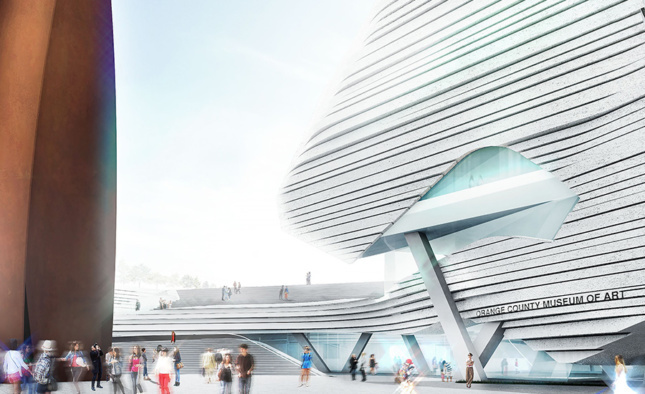 Morphosis’s plans call for 25,000 square feet of dedicated exhibition space, 10,000 square feet of multipurpose, educational, and performances spaces, and a sculpture terrace with capacity for 1,000 occupants. The striated, wind-swept complex is being designed in virtual reality and will ultimately leave close to 70 percent of the surrounding site open for public use.